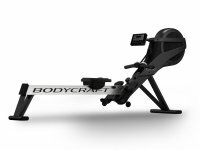 Introducing the revolution in Rowing with the Bodycraft VR200 Pro Rower Rowing Machine. There are many Rowers in the marketplace but none provide the smooth feel of the Bodycraft VR200 Pro Rower Rowing Machine. 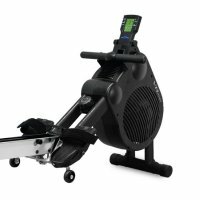 Rated highly by many users and Fitness experts gives this Rower the number one spot on our list for home and institutional use. With its high quality and smooth feeling, its no wonder why many customers are buying the Bodycraft VR200 Pro Rower Rowing Machine over other top name Brands. Bodycraft VR200 Pro Rowing Machine is a leading Rower in the fitness industry. 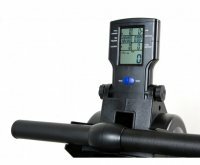 The BODYCRAFT VR200 Pro Air and Magnetic resistance rower shares many of the same features as its bigger brother the VR400 but boasts a smaller more compact size ideal for someone dealing with space constraints. The VR200 also has pivoting adjustable footrests which allow most size feet to comfortably fit into the proper position. The extra wide lock down strap ensures a solid anchor for your feet giving you maximum push power. The footrests will also pivot forward with the natural motion of your body on the return stroke for ultimate comfort. The VR200 features a built in cooling fan. As you pull, the center mounted air vent allows air to be forced through the vent and onto you, cooling you off as you work out. The harder you work, the harder the air blows. This feature really pays off as you test your limits on this rower. The VR200 also features ultra smooth industrial grade bearings housed inside the friction free rollers combined with our ergonomically designed deep contoured seat and a precision extruded aluminum track. Display Shows Time, Distance(Meters), Calories (Cal), Time 500m, Strokes, Strokes Per Minute (SPM), Total Strokes Profile. The VR200 features a built in cooling fan. As you pull the center mounted air vent allows air to be forced through the vent and onto you, coolng you off as you workout. The harder you work the harder the air blows. This feature really pays off as you test your limits on this rower. 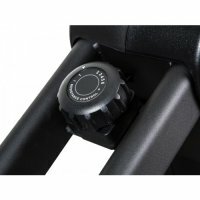 Our pivoting adjustable footrests allow for most sized feet to comfortably fit into the proper position. The extra wide lockdown strap ensures a solid anchor for your feet giving you maximum push power. The footrest lock down for push off and also pivot forward with the natural motion of your body upon the return stroke for ultimate comfort. Zero maintenance commercial quality nylon drive belt is very quiet, smooth, clean and requires no lubrication. Machine tested with 287 Lbs. of stress pulled over a half a million times. Others may use a chain drive which requires constsnt maintenance, lubrication and is very noisy. Boasting 47" in lengthand 34.25" of seat travel, our precision extruded l-beam track delivers a large range of travel for every sized user. The accuracy of the extrusion ensures an ultra smooth and quiet rowing experience. Built to the highest quality specifications, the VR200 frame and all weld points are guaranteed for as long as you own the machine. All other parts are warranted for a period of one year from purchase date. 1 Year labor. 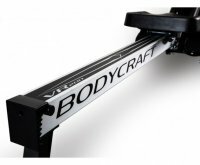 The BodyCraft VR200 is a simple air resistance rowing machine with residential and light commercial warranties. It has some of the same features as the VR400 and VR500, but it’s very light on programming and has a compact size for rooms with space constraints. 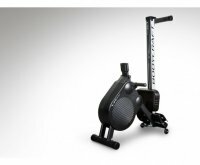 The BodyCraft VR200 Rower is a simpler and more compact version of the VR400, yet it can comfortably accommodate a trainee up to 6’2” tall. Highlights include a smooth aluminum rail and wireless heart rate monitoring. Six levels of resistance are provided with a fan that also cools the rider. Session data are provided but this machine is limited to manual mode. The seat is positioned at 15.5”, which is a bit lower than chair height. The footrests pivot to support a natural rowing motion. 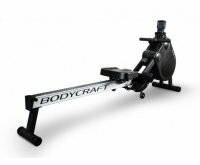 The BodyCraft originally sold for $999 and is now discounted to $799 online. It’s sold with two warranties. The residential warranty protection is lifetime for the frame and one year for parts, wear items and labor. The light commercial warranty (up to five hours/day) cuts the free labor agreement down to 90 days. Data: A pivoting monitor shows time, distance (meters), calories, time for 500m, strokes per minute and total strokes. Handlebar: The handlebar is made from aluminum and has an ergonomically correct grip. High Seat: The seat height of 18″ is comfortable for most rowers. 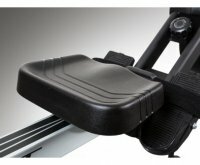 Adjustable: The seat travels 34.25”, making this rowing machine a good fit for people up to 6’2”. Foldable: BodyCraft rowers can be folded to save space. The folded dimensions for the VR200 are 43.25″ L x 21.25″ W x 69.25″ H. The frame has wheels for easy repositioning. Strong Frame: A high-strength extruded aluminum beam supports a smooth glide. The frame is powder coated and the support legs are heavy gauge powder coated steel. Energy Saving Mode: The console powers off after 75 seconds of inactivity. High Capacity: The maximum user weight is 300 pounds. 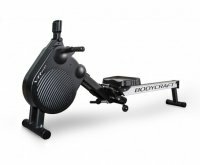 The BodyCraft VR200 Rower is durable yet entry-level. Here are some potential drawbacks. Resistance: The resistance is manually controlled. Some riders would prefer digital controls. There are only six levels of resistance. The resistance is from air and magnets, which is smooth but not very realistic for crew training. Cloth Drive: The handle drive has a nylon belt that looks something like a seatbelt. A preferred alternative is a low-maintenance chain. Wireless Strap Sold Separately: BodyCraft advises that the VR200 might not work with your own Polar compatible strap. They sell chest straps on their website. Fitness Warehouse is an Authorized Dealer for Bodycraft Product. You will be receiving the full manufactures warranty. Your warranty covers Lifetime on frame, all parts for 5 years and 1 Year coverage on labor and wear items.